This is a little like when Adam and went airport hopping. Our plane needed a software upgrade (that’s the sort of world we live in now), and there was a clicking in the radios that the mechanic thought he could trace to the ignition system. So N971RD needed to be in Long Beach for most of Thursday. Friends online suggested that once I had the multi-engine certificate I should make sure to do something fun with it, since the lessons themselves are not a lot of fun (you fly around on one engine a lot of the time). So while our plane was in the shop I rented N570TS, one of the Twinstars that I had not been in for training. I had no real plan, except that I figured I would fly the entire time on both engines, something we really never did during training. The truth is that if you fly a twin day-to-day you never shut down one of the engines. It sounded blissful, since shutting down one engine during training meant stomping on the rudder and holding it there until I was able to land, sometimes with my leg muscles cramping or shaking from the effort. My friend Susan said that the Twinstar felt way too complicated for her, but I think that was the environment that she had done her couple flights in. When you have an instructor next to you forcing you to read each checklist item aloud while you hunt the instrument panel for the switch or gauge, it can feel like an impossible litany with no rationale. If you’ve had enough lessons, the pattern of the check list starts to sink in and you can re-factor it to a flow around the instrument panel. Then it makes much more sense. I had the Twinstar started in a few minutes. Not much slower than in our Diamondstar (and double the engines!). It was not a nice day when I flew down. 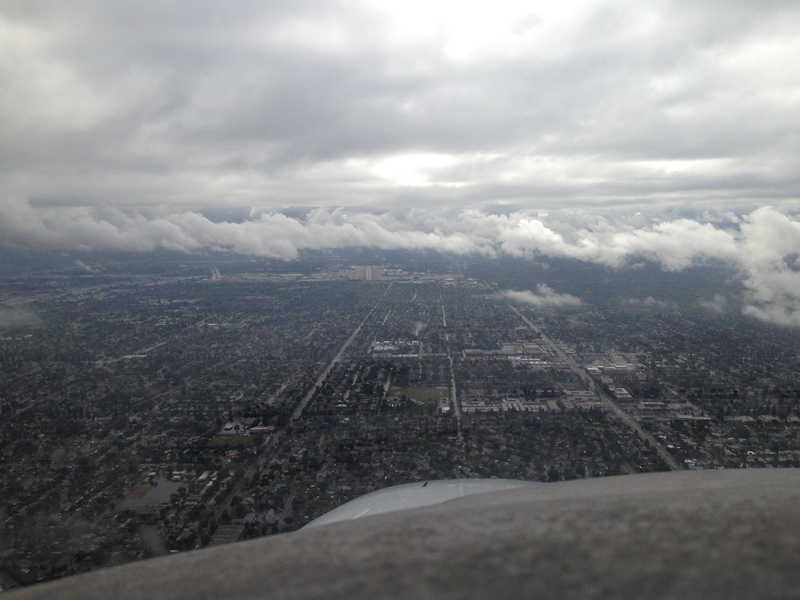 The cloud cover over Santa Monica was unbroken, so I made an instrument departure and flew toward Long Beach on an instrument flight plan (“tower en route”). Over Torrance it was apparent that I could make it down through a broken layer and land VFR. That would save fifteen minutes, so I told the controller I was canceling IFR and continuing to the field VFR. I have no idea why, but he seemed put out. The tower controller at Long Beach had no issue and even let me do a straight in for seven right instead of flying the left pattern for two-five left. Fifteen minutes after dragging the wheels onto seven right I was pre-flighting the Twinstar. This was a payoff for the hard work of the training and it was also an exploration. Would I hate flying a Twinstar instead of the Diamondstar? It was a lot of weight to be hauling around, would it make flying less fun? Would the higher task load of the retractable gear and two engines make it so I enjoyed the sights of being inside the sky less? I also had never used the autopilot in the plane, so what would it be like to be the manager of some different systems? Since it is a crappy day, I need to file another instrument plan to get to the other side of the Los Angeles basin. I decide I’ll hop to Van Nuys. I told Susan that we’d go to lunch up at Camarillo in the Twinstar and I have a couple hours to kill before she’ll be at the Santa Monica airport. It feels just like my original IFR training: pick a location, file a tower en route IFR plan to get there, pick another location and repeat. My kneepad still has the original page for my flight down to Long Beach. I tuck that under a blank page for my Twinstar flights and copy down the clearance to get to Van Nuys. I taxi down to two five left at delta and do the necessary run up. The run up in the Twinstar is one of my favorite parts of the flights. I am sure that if I flew one regularly (like if the Diamond Aircraft Company called me up and said it would really help them out if I would take one of these planes off their hands) I would do the run up on the roll, while I headed up the taxiway to take off. There are a pair of buttons and you hold them in. This tells the engines that you need them to do a run up and tests the ECUs (Engine Control Units). There are two ECUs for each engine, an A and a B. If one fails, or detects out-of-normal parameters, it shuts itself down and transfers control of the engine to the backup ECU. If both ECUs fail, the engine shuts itself down and the propeller blades feather automatically. I haven’t heard of many instances of this. One of them happened early on because a pilot had left a light on in the plane overnight, so there wasn’t enough battery to start or run the engines. The pilot had the FBO jump start the plane. He did the usual run up and things seemed fine. He took off and, when he hit the switch to raise the landing gear, the pump which pressurizes the hydraulic system drained the weakened battery back to zero. The alternators were unable to produce enough amps to run the hydraulic pump, charge the batteries, and keep the ECUs suppled with electricity. No electricity to the ECUs means they can’t keep the engines running and both engines simply shut down. I now know what I am meant to do if the engines shut down right when I raise the gear. Instead of just setting the plane down straight ahead the pilot did something that left him upside down in his plane on the grass next to the runway. He was fine and just needed a little help extricating himself from the aircraft. Diamond promptly warned all owners not to go flying if they had just jump started the plane and they outlined what you were meant to do if you happened to deaden your battery. All of the Twinstars I flew had the design modification they came up with in response: a pair of batteries hooked up to each ECU. If the power from the electrical bus disappears, the ECU runs on battery power. If one battery is dead, it switches to the other. It can run the engines for ninety minutes. So if you somehow kill your electrical system you have an hour and a half to get the plane on the ground before you are flying a very heavy glider (which is also still possible to get on the ground, of course). So the ECUs are, technically, a weak point, but I feel like it is a weak point that has been well-covered. I love that my run up test for the engine is reduced to holding these two black buttons down and watching the simulated failures generate messages on the PFD. In less than a minute, both engines have checked themselves out. They are smaller than the Diamondstar’s engine (135 horsepower compared to 180), and then are out on the wing instead of directly in front of the cockpit, so it is quieter. Once the run up is complete, I toggle two tiny chrome switches to test the ECU’s ability to switch manually. (It used to be that the engines always ran on ECU A and if that failed they switched to ECU B automatically. My guess is that errors and problems with B didn’t show up in the brief test the way they would if it was used more frequently for longer durations. So now it appears to randomly assign an ECU. We can tell because turning the little chrome switch to “ECU B” will sometimes cause the briefest of hesitations in the engine, and other times it is totally smooth. So sometimes the engine is already being run by ECU B. This is not important enough to be mentioned in any of the manuals.) After that, my run up is complete. So here it is, my first solo flight in the Twinstar. And to make it a little more difficult I am launching into an overcast layer that I will enter pretty soon after takeoff. I will be employing the autopilot to reduce my workload. I talk to myself, which I often do when I am flying alone. I should get a cockpit recording going so that if I have an accident the NTSB has my constant narration of the decisions made. 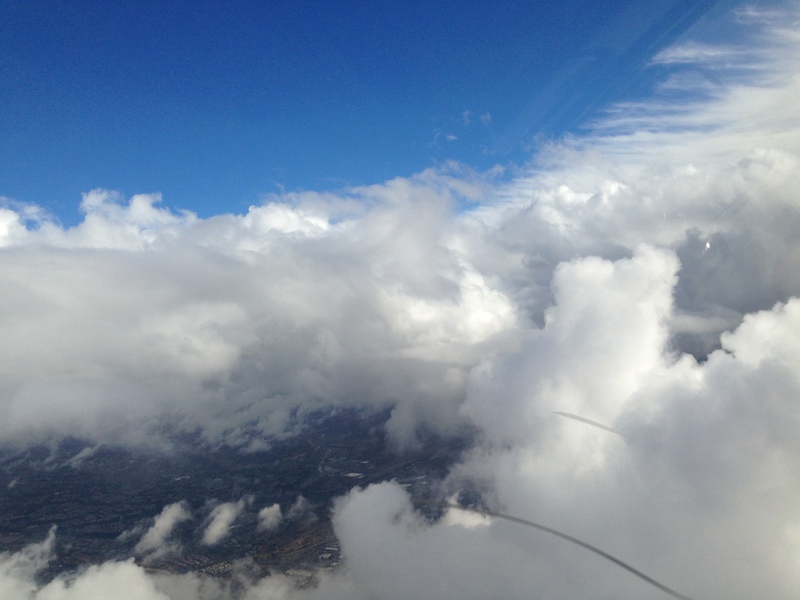 During training the instructor doesn’t let you use the autopilot, except under really particular circumstances. That’s really good for developing your single-pilot skills, since you have to do everything yourself and all at once. As I depart Long Beach I am meant to turn to a heading of 270 when I have reached 800 feet. I make the turn and the plane is climbing at 1,900 feet per minute, a homesick angel rocketing to the heavens. The controller has already cleared me to 5,000 feet, and moments later I am leveling out, reducing the power on the engines, and switching on the autopilot so I can get a little further ahead of the plane. The Instrument Landing System (ILS) approach to Van Nuys’ runway one six right is one that makes me a little nervous in my plane. I am very aware of the terrain that I am flying over, heading north into the foothills toward Agua Dulce so I can turn back south and follow the radio beam back to the floor of the Valley. It is a series of hills that has no good emergency landing site. At five thousand feet I am probably high enough that I could glide to the parking lots of Six Flags, but most of the land below me is “unsuitable for a dead stick put-down.” So I get nervous. That’s the first thing I notice. 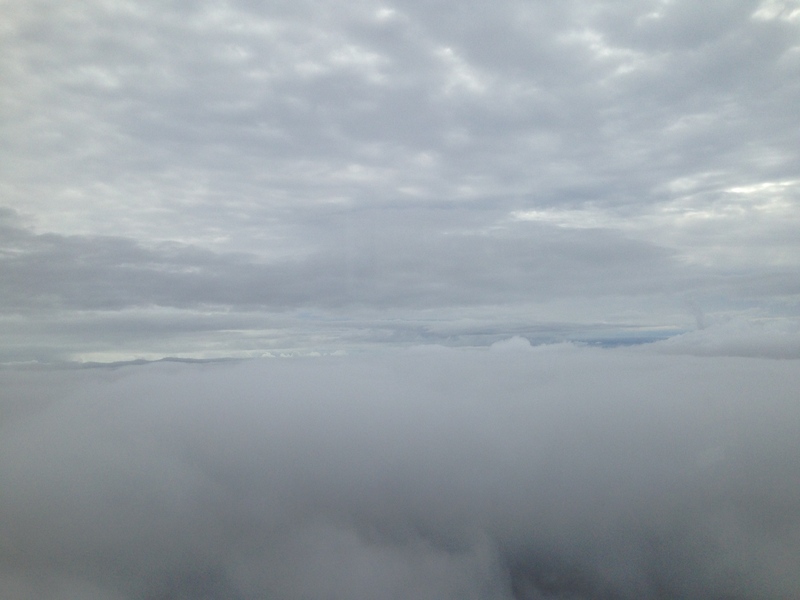 I am not nervous as I descend into the clouds over the hills. 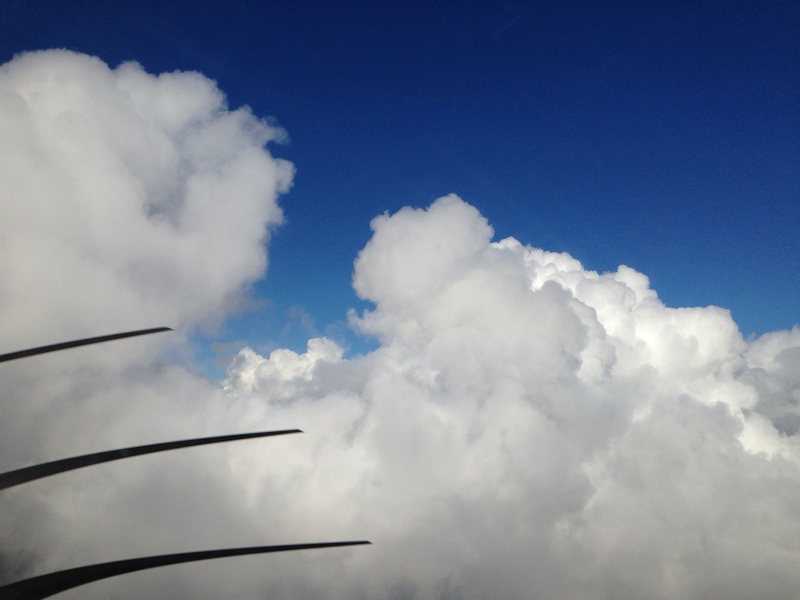 I am not wondering what I would need to do if my one engine quits (declare an emergency, drop out the bottom of the clouds (always keep track of the ceiling over the nearby weather reporting stations), locate a suitable site to try to get the plane down and always fly the plane, fly the plane, fly the plane). I am not trying to watch the cylinder head temperatures (the G1000 doesn’t even display them for the Twinstar’s engines) while also coordinating the approach with the controller, briefing the approach and getting the avionics set up. Although the Twinstar is faster, I am more relaxed and able to stay ahead of the plane with less effort. I understand all the reviews (and pilot reports) that talk about how having the engines entirely cared for by the FADEC (Fully Automated Digital Engine Control) means the pilot is able to more safely fly the plane. If one of the engines failed I would simply be in the very situation I trained for. I have flown five single engine ILS approaches. No pilot with fewer than ten thousand hours has had to fly that many single engine approaches in real life. I am extremely prepared. I was talking to a fellow who deals with used Twinstars and he had a plane that seemed like it had an interesting history (a few choice words in the ad were a clue). He said in email that he would only discuss it on the phone. I called because I am that curious cat. He said that the FADEC can make a pilot very complacent after a few years. The owner of the plane was returning to his home field (which already engenders some complacency) and the approach was to minimums. That means flying inside the clouds is going to keep you busy almost all the way to the ground. Indeed, the owner was very focused on that. And popped out of the clouds and started down to land on the runway. He got right down close to the concrete and realized he had forgotten to lower the gear. It takes time to drop the wheels, you can’t flick the switch and land, so he flew low along the runway and climbed back up into the clouds, re-flew the approach and landed the second time. As I turned south over Highway 14, I was screaming through the sky at over 200mph. The controller didn’t say anything (which meant there was no slower traffic ahead of me on the approach), but I knew I would have to slow down as I descended. In the Diamondstar that’s sometimes a trick, it is a really slippery plane and dropping the nose will add knots onto that airspeed meter unhesitatingly. But the Twinstar has a secret weapon. As soon as I am set on the glide slope and sliding down it toward the touchdown point on one six right I move a switch and watch all three green lights light up as the gear extends. I keep my hand on the switch until I see all three lit, that’s how you make sure you don’t approach the landing with the gear in some indeterminate state. The gear on most twins has a speed for extension; you aren’t meant to drop it until you slow the plane below a certain airspeed. In the Twinstar the limitation is only that you be below Vne, the never-exceed limit for the airframe (184 knots, in case you flying one now and need to know, it’s the top of that barber pole portion of the airspeed indicator). I flew enough in the lessons to have experienced the effect and I’m not worried about the speed I am carrying (technically it is excess kinetic energy). As the gear drops into the slipstream the nose dips a little, reacting to all that drag on the belly of the plane, but the knots bleed off like I’ve thrown a sea anchor out the stern. I drop out the ragged bottom of the clouds over Van Nuys. The busiest general aviation airport in the country is directly in front of me. Courtesy of the radio beam, I am lined up perfectly for runway one six right, a runway so famous that there’s a documentary named after it. I’ve slowed enough to add a notch of flaps and, as I get within two miles of my touchdown point, another notch. There’s no passenger and no one to appreciate it, but I put the main gear down at the start of the thousand foot markers without the slightest bump. I keep the nose high using the drag on the airframe for aerodynamic braking. The tower tells me I can take the high speed exit and I ask for a tower en route clearance to Santa Monica. The controller says I can switch to the clearance controller instead of ground and make my request with them. I am sure I have mentioned it before, but they did a cardiology study and attached sensors to a whole bunch of different professionals. There were only two that had increased heartbeats across all the tested individuals, and only in two situations. Major League Baseball players always had an increase in beats-per-minute when they stepped up to the plate. And professional pilots starting an instrument approach in actual Instrument Meteorological Conditions (IMC) had their heart rates rise. 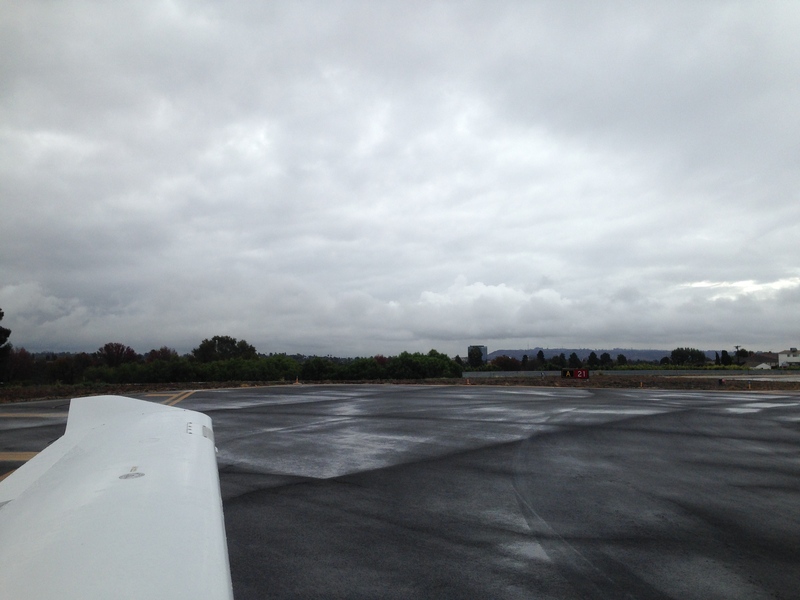 So I am never concerned or embarrassed to be taxiing along after a real instrument approach to have my heart hammering in my ears, having successfully ignored my animal brain and rationally followed the instrument readings through sensory deprivation in the clouds to safely put the plane on the ground. By the time I get down to the end of one six right again I am ready to copy my clearance instructions. The flight back to Santa Monica is one of the more difficult tower en routes in the LA basin. The Glendale 8 departure always seems a little fuzzy to me, relying on a DME off of the Van Nuys VOR and seeming to have something to do with noise abatement rather than obstacle avoidance. And after making my turn I am meant to join a VOR radial off the same VOR and head toward the first navigation fix on the approach into Santa Monica. So I am barely departing and I am already arriving. Again, I am busy in the cockpit staying ahead of the plane as it climbs into the clouds and comes out into the blue sky and sunlight above, but I don’t think about the engines at all. I slow it down a little when I get level, knowing that the SoCal controllers tend to keep arrivals into Santa Monica a little high (which means they get a little fast and can wind up in trouble when landing). In fact, when I get cleared for the approach I am glad to have the landing gear to throw out as a set of huge speed breaks. 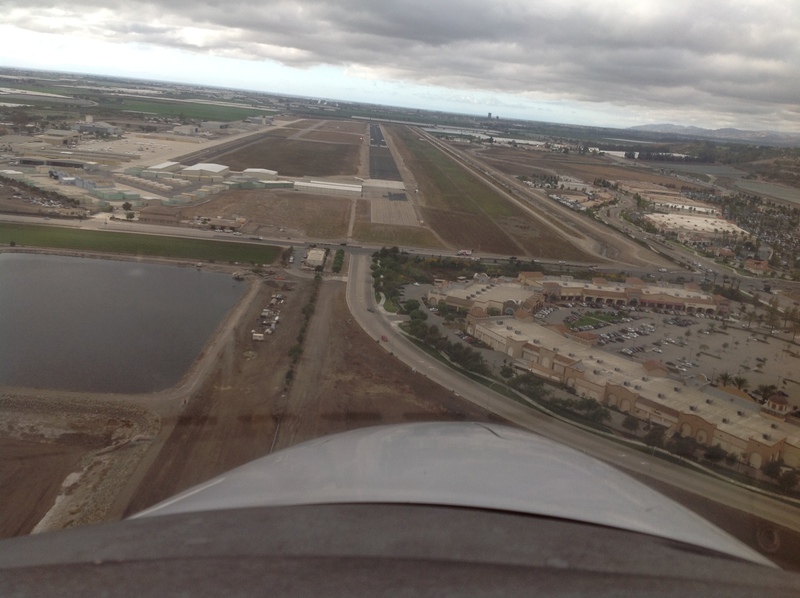 As I descend out of the wispy cloud cover over Century City, abeam the Die Hard building, I am putting in flaps and have slowed to the ideal short approach speed. When I land I make an impulse decision to park at Atlantic Aviation. I have never parked there at my home airport but the one thing I am still a little wary of in the Twinstar is taxiing it. I am very aware of the high cost of hitting a taxiway light or runway sign with one of the propellers. A friend online did that and said it was the saddest twenty-five thousand dollars he ever spent. Fifty dollars for the ramp fee seemed like very inexpensive insurance against trying to get it properly parked over in the transient parking area. (It’s wingspan is too large for our tie down spot. I needed to park for an hour until Susan planned to be at the airport.) Atlantic’s line guy was a little confused to be driving me back up to my car by the northeast tie downs, but they were friendly and helpful. When I returned to the airport I collected Susan from the observation deck (simplest parking for her) and we drove over to Atlantic. She took the photo of me standing on the wing. Once we were in and set up with headsets and seatbelts I showed her how simple it was to do the engine start with the flow I was developing (a sweep around the instrument panel starting at the gear level and continuing around clockwise). They marshaled us out from Atlantic, the first time I have been marshaled at my home airport and one of the only times I have felt it was necessary to be marshaled. (That’s when the line guys, or in this case two of them, wave their red batons and you taxi the airplane right where they tell you to.) I always get waved in by the line crew, but usually when I am departing I fire up, turn right as I leave the parking spot and I’m on a taxiway talking to clearance or ground controllers. At Santa Monica’s Atlantic their parking is tight and they just have a single row of plane facing the building. To leave you have to pull forward to the building and then taxi east while steering between a row of cars that parks in front of the building and the row of planes. The cars are almost all luxury brands, and I watched my wing tip glide along their rear bumpers, but the planes are mostly ten to forty million dollar jets. I trusted the line man with his bright red sticks and hearing protection. I kept glancing at the wingtip and then at him and he’d give me a thumbs up. Taxiing up to runway two one I showed Susan the run-up-on-the-roll. We decided to scud run up to Camarillo, talking to Point Mugu’s tower as soon as we were within range of them. We’d stay off shore a bit and keep a sharp eye out the window. I always get VFR flight following because having the controller’s eyes on the radar scope keeping me from running into another plane is really comforting. There was a midair collision in the past few months between two planes from Santa Monica airport. It was an overcast day and neither pilot was talking to SoCal’s excellent approach controllers. One of the controllers said that he saw the radar targets converging at the same altitude, but he couldn’t warn either of them because they hadn’t tuned to his frequency or checked in. So as a rule I am talking to someone. We talked to the Santa Monica tower controller almost all the way to Point Dume and then switched to the Point Mugu marine base tower controller a few miles later. I suggested Susan fly the plane a little so she could feel the difference between it and the Diamondstar (she and I have the same plane). She flew a little bit and said, “I don’t know why am doing this, the last time this happened it was in your Diamondstar at exactly this spot over Malibu and it cost me a lot of money.” On the other hand, she’s crossed the continental United States in her little Diamondstar and is an excellent pilot. 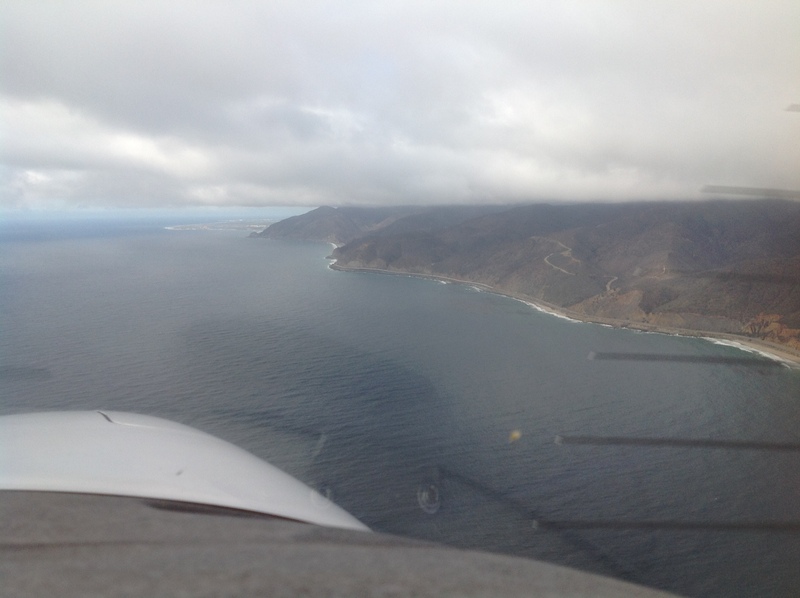 We turned inland as we reached Point Mugu’s airspace. There is a trio of small airports on the plain between the Santa Monica Mountains and the Santa Barbara Range: KCMA (Camarillo), KOXR (Oxnard) and KNTD (Point Mugu). They are so close to one another that their airspace, rather than being separate circles centered around each airport, is squished together like three marshmallows. I was a little nervous that the military controller wasn’t going to let us go before we entered the airspace for Camarillo, but he did with a moment or two to spare. I have fewer than twenty landings in the Twinstar, so entering the pattern is still a moment of heightened awareness for me. As I flew downwind and talked to the controller I was checking the landing point behind me. I felt a little fast so, of course, I dropped the gear. Adding flaps as I made my turn to base and final I pulled the power levers back some more. With the power out and the drag from the landing flaps and gear the Twinstar comes out of the sky like an elevator. As we crossed the fence of the airport border and added a little power to slow our descent. The trailing link landing gear on the Twinstar absorbs an initial impact quickly but rebounds with much less energy. So it keeps the plane from bouncing if you land a little hard. It also irons out any sort of skip on the runway. 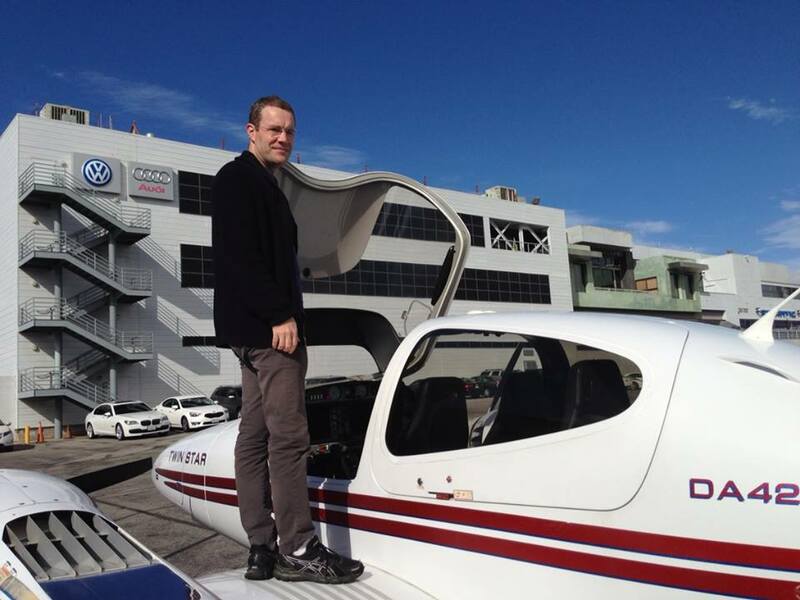 In short, it turns beginner’s landings into professional ones. Susan said, “That was amazing!” since I had warned her that I so few landings under my belt so far. After a delicious lunch at the Waypoint Cafe, we headed back to Santa Monica, the same way we came. It was a great flight. I dropped Susan at the observation deck (doing a terrible job of parking in the transient parking, but I only had the canopy open for two minutes) and picked up my tower en route instrument clearance back to Long Beach. I still had the clearance on my kneeboard from that morning’s flight down, so when the controller asked if I was ready to copy my clearance I read that back and asked for the new squawk. 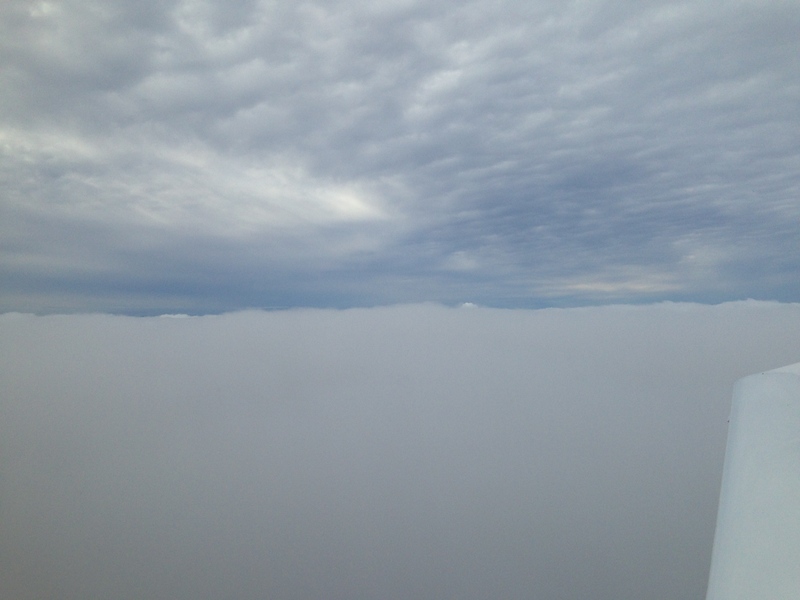 Once again, I was able to cancel IFR once I was over Torrance and the clouds had scattered a bit. I ducked toward the airport and the tower cleared me to land two five left even before I entered the downwind leg of the pattern. My plane was ready to go with it’s software updated and the ignition leads more securely fastened to cylinder number two, particularly the left magneto’s leads. There was no more clicking on the radio, which was a relief. I flew our perfect little plane home and thought about what sort of difference it would make to our adventures if we were flying in a Twinstar instead.